The question most media outlets and intelligence agencies are asking themselves right now is the role Kim Jong-un will be able to play after the sudden death of his father. Too young, too inexperienced, too early: the odds could well be against him if he chose to absorb too much power or a faction of the army or the leadership plotted against him. However, to the eyes of the brainwashed North Korean people, a second hereditary succession might be seen as legitimate: apart from the well-known isolation from foreign realities (no Internet, no contact with foreigners and radio and TV sets pre-tuned to government stations), the refined propaganda machine created by Kim Il-sung and perfected under Kim Jong-il’s tenure combines Confucianism (the values of the old Joseon dynasty, which ruled Korea from 1392 until 1910), Christian religious imagery (to vividly justify the God-like status of the Kim family), Stalinist propaganda and repression methods and fascist Japan’s myth building and discursive elements create a suffocating propaganda environment from cradle to death for the vast majority of North Koreans. Moreover, the propaganda machine has quickly revved up the Kim Jong-un discourse. On December 19, 2011 the Korean Central News Agency already described Kim Jong-un as “a great person born of heaven,” a propaganda term until then reserved to his father and grandfather, and “the eternally immovable mental mainstay of the Korean people”. Meanwhile, the Workers’ Party Rodong Sinmun newspaper asserted that he is “the spiritual pillar and the lighthouse of hope” for the military and the people, while also claiming that Kim Jong-un was born on Mount Paektu, the same place in which Kim Jong-il’s birth in 1942 was theoretically greeted by a double rainbow and the formation of a new star – Soviet records place his birth at a village near Khabarovsk, in Siberia. However, something different from a personalized rule by the unproven Jong-un might be in the works. When asked by several international media outlets about the leadership status in the DPRK, approved spokesman and KFA Chairman Alejandro Cao de Benós stated that the new leader was Kim Yong-nam, the 86-year old Chairman of the Presidium of the Supreme People’s Assembly 86, while asserting that Kim Jong-un’s political career is just starting and that he is being hailed not as a supreme leader but as a shining star that “will lead the new generations down the socialist path”. Mr. Cao de Benós’ assertions should not be taken at face value but, as usual with news emanating from official North Korean sources, with a pinch of salt. First and foremost, he is implicitly corroborating that Kim Jong-il died too fast, too soon for his son to assume the leadership. Moreover, reading between the lines we can foresee a strong chance that North Korea is headed, at least in the short-to-mid-term, towards a collective leadership. By assuring that the new leader is a figure that chairs a rubber stamp, quasi-ritualistic institution, the North Korean elites are leaving the door open for more influential figures to take a leading role. Collective leadership should be seen as a practical way to avoid internal tensions that could cause regime collapse in a context of a second hereditary succession involving an unproven youngster in a society where the military holds paramount power. As already stated, the revamped institutions the country enjoys since 2009-2010 might help explain what many analysts consider a more stable situation than the one Kim Jong-il inherited when his father died in 1994. Only unexpected events or an ill-advised move by the inexperienced Jong-un, who is expected to be named Chairman of the National Defense Commission before Kim Jong-il’s funeral on December 28, could stir opposition and create a context in which institutional failure could take place. Will relations with South Korea and the U.S. improve? Important developments in opposite directions were taking place just before Kim Jong-il’s death. On the one hand, there was a clear and unexpected rapprochement with the Obama administration, with exploratory talks starting last summer and leading to the above-mentioned aid deal. On the other hand, we observe a clear dismissal of South Korean efforts to turn the page after the 2010 Cheonan corvette sinking and Yeonpyeong island shelling: despite efforts by Seoul’s new Minister of Unification Hyun In-taek, Pyongyang rebuffed all calls for a bilateral meeting and is indeed waiting for a possible government change after the presidential elections that will take place in South Korea in late 2012, hoping that the new president will show a more conciliatory attitude than current leader Lee Myung-bak. Looking forward, we should expect the new North Korean leadership to ratify the still secret deal with the U.S. and seek similar aid packages from other partners, such as the European Union. As some analysts have pointed out, an invitation to reopen six-party talks with the U.S., China, Russia, Japan and South Korea should not be ruled out, although the priority of solving internal affairs will probably delay foreign policy overtures. Relations with South Korea can indeed only improve, either via the resumption of multiparty talks or if Pyongyang’s hopes turn out to be true and South Korea’s next president turns out to be a progressive who adopts a more conciliatory, Sunshine Policy­-based approach. Can we realistically expect some kind of glasnost or perestroika in the DPRK? Obviously, only time will tell, but the most obvious answer right now would be no unless the current regime collapses. In fact, an opening-up policy would severely undermine the legitimacy and power structure of the current leadership, built upon extreme secrecy that keeps most of the population in the dark about outside reality and thus allows the regime to keep their loyalty despite extreme hardship. However, we might indeed expect a progressive economic opening and reform process. As argued by reputed scholar Andrei Lankov, a fast, full-scale economic transformation process, mirroring the transformations in China or Vietnam during the last 2 or 3 decades, would prove disastrous for the current leadership, and will undoubtedly be avoided by the North Korean ruling class despite increasing Chinese pressures for aperture. Least but not least, is unification with South Korea possible? The answer, right now, should be a strong no… unless the regime collapses. Apart from the North Korean elite’s self interests, the current status quo greatly benefits China, which sees the DPRK with a mix of Cold War thinking – i.e. as an impoverished, unpredictable but loyal buffer state between itself and South Korea, an American satellite – and a capitalist utilitarian approach – i.e. as a source of valuable minerals, of infrastructures with key strategic and commercial importance and, in the mid-term, also of cheap labor for its exporting industries, – and is therefore not interested in seeing the DPRK fall into Seoul’s lap. This explains its unwavering supportive attitude towards the North Korean regime: we can fully expect China to increase its material support for North Korea to ensure the internal stability necessary for a smooth transition. Combined with internal legitimacy and institutional support, China’s help and influence, recent American overtures and non-intervention by other regional powers – wary of upsetting China and unsettling the current stability in Northeast Asia – should be enough to guarantee a smooth leadership transition. 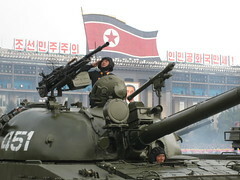 However, in the unlikely event of regime collapse, the most feasible solution would be an eventual merging with South Korea, probably with UN mediation and after both Chinese and U.S.-South Korean troops occupied the country to prevent mass refugee flows and to assure control over the DPRK’s stock of weapons of mass destruction (WMDs). Still, reunification would pose a huge economic and social challenge to South Korea, on a much higher scale than the much-compared German reunification of 1991, and would require massive international help – an even thornier issue in a recessionary economic context. All of this, combined with the quickly fading interest in reunification among many younger South Koreans, explains why none of the involved parties will press for the status quo to radically change. Time, once again, seems to be on North Korea’s rogue leaders’ side.